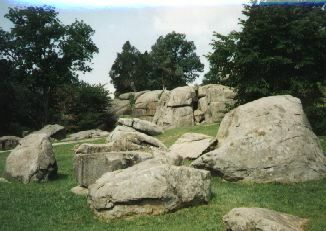 Above is a photograph of the Devil's Den (western side) taken shortly after the Battle of Gettysburg. This mass of boulders, captured as Hood's Confederates swept Sickles' III Corps, was an ideal location for Confederate sharpshooters to harass Union troops on Little Round Top. Union artillery on Little Round Top fired into the Devil's Den where, they hoped, the concussion of their high explosive rounds would kill the sharpshooters hiding there. Below, is a more recent photograph (eastern side), taken in 1996.